For those of you who do not know who notall is, go here to get a crash course please. Then Return! Anyways, the group dropped their fourth single on July 13th; my baby, my lover. The single also happens to be their first anniversary one as well. After I had my interview with the group, I was hoping that they would release a new single shortly there after. On July 5th, I noticed that they had uploaded a new music video. I immediately clicked play and I was so amazed at the video and the song itself. In a good way, not bad. After watching the video, I went to their website and saw they were releasing the single on July 13th. Shortly there after, I went to CDJapan and pre-ordered it and I have not been disappointed with my purchase. The day of release, the single placed eighth on the Top 10 Oricon Daily Sales Chart. About three days ago before this was written, it arrived and I instantaneously put it into my computer to listen. As Japanese idol singles go, there are usually three songs. The title track and two coupling songs. The title track is of course my baby, my lover. This song is a perfect song if you have a significant other. Even if you don't like myself, it is still a great track to listen to. I need you, I miss you, I love you." The lyrics really stand out in this track as they are really good and in harmony with each other. The tempo is fast paced and has a little bit of EDM to it, which is refreshing to here in this kind of track. The ladies look absolutely pretty in this video, both in the cinematic shots as well as the dance shot. It makes you feel like you are on a date with one of the members, which I like in a music video (accidental creeper). The problem is, which one do you choose? The coupling tracks for this single are really as top notch as the main track. No joke! Nounai Live! is the title for the second track. This song has everything I want in a idol song. It has guitars, a funky groove and your brass instruments. I love the tempo to the song as well. it picks up in the right spots and drops at the right time to bring in the vocals. The instrumental part in the track is superb because it gives you all three aspects of the melodic charm. The vocals are so contagious that you could keep jamming out to this for hours on end. As for the third and final track to this single, Oniku de Night Sensation. According to Tokyo Girls' Update, the group performed this song at Niku Fes earlier in the spring. The song also incorporates the names of 21 variety of meats. What a effort to remember those names! At the start, you can get that wota chant and the fist pumps going due to the strong beat. Then the vocals come in, with a amazing beat drop. The beat for this song is so out of this world, it makes my head hurt. Again in a good way. It has the techno vibe mixed with a heavy rock presence that will shake your cars side mirrors. Once more, the vocals they pour in are really great. They match the vibe for this song. I honestly, can't describe how many times I have listened to this track as well. I love it. 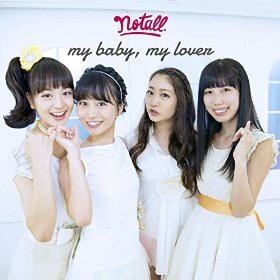 For their fourth single, I give notalls' my baby, my lover a big A+! I simply loved this single to death. I've listened to it over and over again. I've shown my co-workers the music video for this single and they like it a lot. I'm slowly but surely turning them into fans. I look forward to their future videos and new single releases and I hope you do as well. Congratulations on a great single! I wish you all the best! And as always, Please have a great day wherever you are!